E-14 has been ordered in 14th October 1912. Her production started in 7th July 1914. 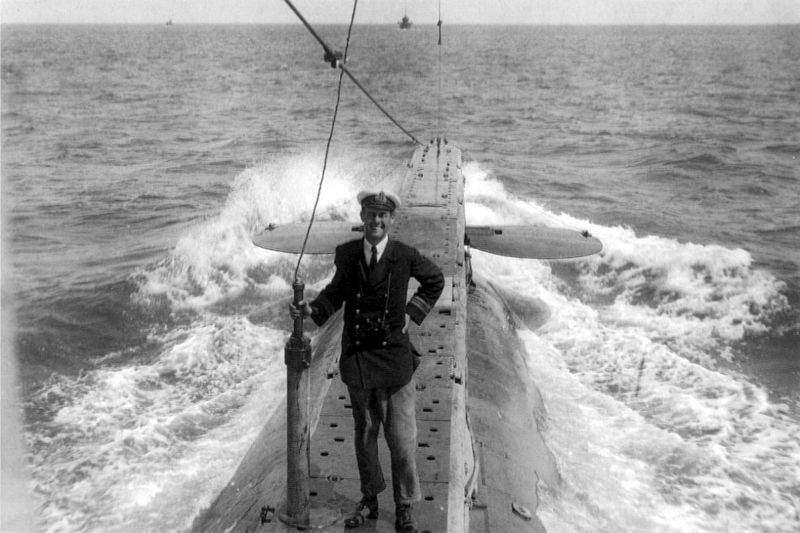 E-14, was an English Submarine, completed in 10th December 1914, by Vickers Limited. Barrow-in-Furness. Lt.Cdr A.C.Boyle – Victoria Cross. Lt.Cdr. G.S.White - Victoria Cross. 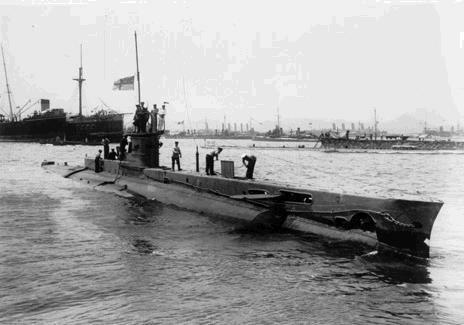 The second infiltration try to the Straits were performed by E-14 Submarine under the command of Courtney Boyle. E-14 were become the second submarine that infiltrated Straits after the first one B11 Submarine. While her infiltration, AE2 submarine was helping her but after AE2 got heavy damage from a war ship's shells, Her commander Stoker decided to run. In the night of 26th April 1915, E-14 surfaced in the Canakkale Straits. But because of the smoke and sound coming out from her motors, shore guns easily found her and started bombing and she were forced to dive again. E-14 moved her way with a broken compass. Whenever he rised the periscope, they were noticed. He sunked a big Turkish Torpedo Boat with one broken periscope using the backup one. They dived immediately and after a blind journey for six hours, They reached the sea of Marmara. They had a chance to surface and recharge their battaries in the middle of the sea. In 29th of April, they attacked to a convoy consisting of two troop carrier and three destroyer ships. She could fired only one torpedo until she had been noticed and dived. Still with her one torpedo, she managed to sunk one of the troop carrier ships. She meeted with AE2 submarine who run out of torpedos. They decided to meet again next day but AE-2 couldn't come to the meeting because she had been sunked. She sunked Nurelbahir Gunboat in 1st of May 1915. For four days E-14 submarine looked for a target and in the end she sunked only a little mine layer ship. For a while she made unsuccesful attacks. In the evening of 10th of May, She attacked a convoy consisting of two big cargo ships and one destroyer ship near Kalolimni island. Her first torpedo did not hit the target but her second torpedo hit the ship "Gul Djemal" and sunked her after E-14 dived. At least E-14 thaught she sunked, but the support ships towed Gulcemal to Istanbul before she sunked. After some time she was scuttled in order to be used as raw material. After this event she got her orders that was saying to return and she returned to the allied ships area. After this event Lt.Cdr A.C.Boyle had been given the Victoria cross medal. A few air attacks have been made to the Goeben (yavuz) war ship who ran aground near Nagara Point, Canakkale while returning from a sudden attack in Mundros but none have succeded. E-14's captain had changed. E-14 under the command of Lt. Cdr. G.S.White was given the mission to sunk this ship but when she reached Nagara point in evening after passing the anti-submarine nets, they saw that the Goeben left the area. There were nothing to do but to return. In her way, they saw a merchant ship and fired a torpedo. But the torpedo exploded very close to the submarine and damaged the submarine badly. She continued her way for two hours from Straits to the open sea but because of the too much flooding of water they lost control. Lt. Cdr. G.S.White decided to surface and when they surfaced she has been hit by Turkish Guns near Kumkale instantly and sunked in 27th of January 1918. 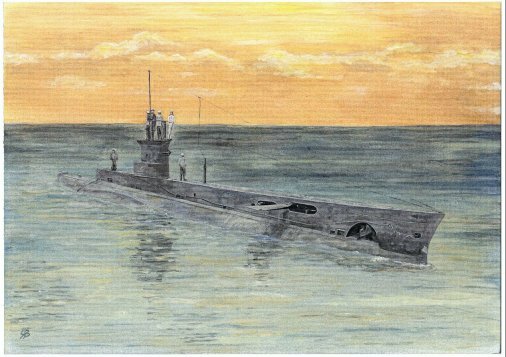 The search for the wreck of E-14 submarine still continues whose only 9 crew survived where 27 of her crew died. Captain White was killed by shell fire. I intended writing you earlier, but I have been on the move ever since I arrived. I have been to Portsmouth for some uniform, and to Weymouth to see an old friend who was at Malta, when I used to call there in E. 14. I returned from the latter place the day before yesterday, and will remain here until the 6th of January, for my leave is up then, and passage to Australia as soon as possible after that. So I hope by this time next month to be well on my way to you. I wish I could leave for home now. I detest this hanging round doing nothing, aid spending valuable time and money to no avail. I know practically no one in this country and I assure you I pray for next month to come, when I shall board the ships for dear old home after nearly five years of roaming adventure and misery!! I'm coming to stop too!!! I think!!! I have great notions for the land, but of course I must wait until I get out there to see how things are. I believe our governments are assisting to open up the land. Aren't they? Well my dear father and mother. I put up with something in Turkey. I assure you! I will commence my story by describing our experiences just previous to the sinking of E.14, which too: with her twenty-three of the best I had ever had the honour to be boat mates with!! We were at our Base in Corfu, from which port we were patrolling, when we got the news that the GOEBEN and BRESLAU had ventured from their hiding place in the Dardanelles, and sunk the monitors RAGLAN and No28; of course you will remember having read all about that the BRESLAU was sunk and the GOEBEN, had struck a mine or mines, and managed to escape back into the Dardanelles, thought badly damaged and was forced to run aground in the Narrows, for temporary repairs before she could be taken further. Next night we received orders to proceed from Corfu! under sealed orders. The French Admiral sent for a list of names of our boat crew, and we half guessed what our mission was to be. Well we reached Mudros on Wednesday morning, January 25th, 1918 if remember rightly, and found E2 and E12 already there; anyhow we were pleased to lean that the job was to fall into our hands as our captain was the senior man in the subs there! Well we straight away filled up with fuel, provisions and water; had new knives fitted, as well as jumping wires, for clearing the nets and other obstacles, we knew we would meet on our passage up the Narrows and Dardanelles! I was busy all the time with the torpedoes! I was fore-end man and had the two bow tubes, of course it was my tubes that were going to do the dirty on "Monsieur Goeben". Well we were ready by Friday, up to the scratch with everything! The aeroplanes were daily raiding the ships, and up to Friday, reported sixteen direct hits on the "Goeben" Friday a gale sprung up at mid-day and we where ordered to go along side the aeroplane ship ARK ROYAL: we were proceeding across Mudras Harbour, to carry out this order with every intention of entering the Dardanelles that night. I'm blessed if we didn't run aground and it took until Saturday night to get us off of course we had to discharge fuel to lighten the boat, and that meant a few hours extra to fill up again, when we got off. When I was in the small boat which we carried, I happened to go round the starboard side of the boat at the time she was aground, and her being high up out of the waters, I noticed that a rivet had come out of one of the tanks. I reported this to the Captain, as I knew quite well it was quite enough to cause considerable bother to the trim of the boat when diving. Anyhow, we got off the mud bank, and fuelled and was ready again, by Sunday afternoon. Bear in mind a gale was blowing during all this time and after Friday morning our aeroplanes were unable to visit the GOEBEN. Well we left Mudras at 6.30P.M. on that Sunday, dived at midnight behind Rabbit Island, and proceeded into the straight. Nothing happened until 6.00PM. Monday when we could hear a rattle above us and the hull of the boat, than a squadding sound as if we were in the mud. As a matter of fact we were. Evidently we had hit the nets and that deflected the boat, then the strong current caught us and we went into the mud, suddenly finding the depth gauge jump from the depth, to show surface. The skipper hurried onto the bridge; came down again reporting that lots of small boats were about, but as it was dark he didn't think we had been sighted, and that we were opposite Chanak, also that the season lights were searching the heavens for air craft!! Then ordering full speed astern on both motors, we slid off and dropped to a hundred and twenty five feet, I suppose, before the searchlights were again pointed to the water. We proceeded on without further trouble until 7.50. We were to attack GOEBEN at 8.00A.M. and at the same time our air forces were to raid, to attract attention on hoard GOEBEN and in the forts from us. Well we came up to 23 ft to have a look through the periscope at 7.30, and happened to be quite close to the place where our quarry was supposed to be lying. The skipper searched round and said "God she's gone". He measured of on the chart the distance to the sea of Marmara, evidently weighing his chances of catching our prey on her way to Constantinople. But the battery was getting low and he had to abandon that ideas. I should have said that GOEBEN was previously aground on the Sea of Marmora side of Cape Nagara and that is where we expected to find her. '? 'm not going back without firing a fish, after coming all this way. I'11 have a look in Nagara" was the words the captain used. " There are a couple of ships," he said, "alongside the quay. Get the starboard bow tube ready." Then came the order "fire". I dropped the ball, and the torpedo had had hardly time to clear the tube, when there was a terrific explosion outside, which sent a blue flash through the boat and gave my head such an awful pain, all the glass lamps and gauges shattered, light woodwork, lockers etc split, and worst of all water was pouring in over my head like a river. I hadn't time to replace the firing gear- on the tube; I dashed my hands to the clips on the hatch overhead, and screwed them up, stopping the rush of water, for instead of being holed as I thought we were, it was the hatch forced by the explosion. I reported it right forward and the skipper ordered "take her down to 125 ft". The explosion had lifted us right up to surface, and though we were there for only a short time, they must have put two or three rounds through the conning tower, for as soon as we showed our periscope to fix the torpedo, a mighty artillery bombardment commenced and we could hear shells hit the water over head quite plainly, it really sounded as if they were actually striking the boat, but of course they couldn't harm us by gunfire so long as we were under. Now we got headed down the stream and kept at 125 ft hoping that we would be out of the Dardanelles by about 12.30. The explosion occurred at 13 minutes past nine in the morning! At about 10.00 o'clock the gunfire ceased, but we could hear small, or perhaps big, power driven boats pass over us, and each time we half expected another depth charge, for that is what caused the explosion we have found out since. Anyhow, after a while all noises ceased, and we gave a sigh of relief as we told ourselves we must be well clear of the Narrows, and soon coming up in safety outside!! All was going well until thirteen minutes past one, when the skipper who had just finished playing cards with another chap, thought we would be just about out and that he had better take observation. So he ordered "Bring her up to 25 ft" And the boat wouldn't come up , so he gave the order to blow ballast, that was done, but immediately he said "shut off pressure," the boat took a mighty heave to starboard almost turning right over, men and everything that would move fell into the bilge, at starboard side. 'fire captain ordered flood 3 and 4 externals again, and the boat up righted herself. Hurried search was made to see if the cause of the trouble could be located, and all the time the boat was sinking, making us believe she had lost buoyancy, for once a sub loses buoyancy it is all up. So the skipper had to blow again and immediately pressure was shut off she repeated her previous actions, over she went; and rapidly rising and in a matter of seconds only, we had broken surface; of course the forts were on the lookout and spotted us at once and crash came a shell right into the boat. Of course we couldn't dive again, the skipper Lt Commander White said "Open the lower lid of conning tower". That was attempted, but the towers were flooded. when he ordered "Open fore hatch, get under way on the engines as quickly as possible". Of course I commenced getting the clips of the hatch and it was a job too, for I had screwed them up tightly after the explosion when we were down with a great pressure of water outside, so you can imagine it was very hard to unscrew them when we were on the surface and no pressure outside. Anyhow I managed to get them off and open the hatch. 'he boat was well down at the bows all this time, and that didn't make things any easier. A violent bombardment was being concentrated on us from the time we broke surface. After opening the hatch, the skipper said to the several men who had come for'd "Go on, up my lads" and when they had clambered out I went up with the Captain. We went on the Port Saddle tanks (that is those tanks, perhaps you can notice them on the photo of AE2; which hang like huge blisters along side the conning tower. Here we were in the most sheltered position, as most of the fire was coming from Sedd el - Bahl -side, not so much coming from Kum Kale, but quite a considerable amount. Chanak was reaching us, as well as gum-boats there. A Turkish Officer told me or rather us that estimate given, was that two hundred and fifty rounds a minute were being fired at us. As I was saying we got on to the port saddle tank, and the skipper asked "Is any one at the Wheel," I said 'no, I'11 go up". I did so, but it was disconnected down below when we dived the previous night, as I was the last one on the whell before diving! I informed the skipper and he said "Tell them to connect up and steer below, put the helm hard-a-port". We had previously been heading for Kum Kale, but putting the port helm on, she turned towards "Sedd-el-Bahl". The next and last thing the captain said was "Midships" and just as I was repeating his orders to the chaps on the after hatch ladder, a shell landed two feet away from me, and tore the plating as if it were paper. Of course the boat had been hit many times before this, but this shell must have gone through and exploded in the beam torpedo tubes, killing about ten of the crew inside. Well a piece of shrapnel from this shell just bruised my knuckle on the third finger, and knocked a little bit off that old ring you will remember me having. The shrapnel must have been well spent, probably it had gone right up in the air and was just coming down again, when it hit me with no more force than a boy could throw a stone, for I actually saw it and in fact picked it up and handed it to the Third Officer, saying "Here you are, a bit of shrapnel for a curio" He laughed and took it. The next moment I found myself alone on the tanks, all the men, skipper, and Third Officer had suddenly disappeared. Then the boat started to sink and the water rushed up my legs and it reached my waist, the boat going full speed, of course I was swept away. My first thought was to get clear of the propellers and as I was facing the boats, I laid on my back and kicked out just as I got in line with the stern of the boat, the after end lifted itself in the air, and down it went. E. 14; standing on her head for a second and her propellers whizzing round and pointing sky-wards, she plunged under as if she had been suspended from some huge air-ship and dropped head first! As she was going I spotted our wireless operator badly wounded and apparently unconscious, so I got hold of him and tried to "Buck him up". He wasn't unconscious, though he had got one through the jaw, I caught his hand and discovered his thumb was just about blown off, so I collared him round the waist and told him to keep up spirits, but he kept on saying " I can't, I can't, I'm done!!" It was fearfully cold in the water, and I was afraid of getting cramps. I looked to the shore, but there was no sign of a boat coming and the infernal Turks were firing as much, as they were when the boat was afloat, and one could hear the "zip,zip" of rifle bullets, in fact poor Pritchard, (the wireless chap) put his hand up, once, presumably to attract the attention of the people al Kum Kale, as we were close to the shore, and I'm darned if he didn't get a bullet through his wrist. Eventually the firing stopped, but for a long time no signs of assistance was forthcoming. I was tired, and spotting the signalman swimming close by, I asked him to help too keep Pritchard afloat. We managed it between us and I am pleased to say the fellow who is only 19 now, is alive and well. After a long lapse a motor boat came out, and "hucked" us aboard 9 in all, three were wounded. We were landed at Kum Kale. Well I must finish now. You learn how we were sunk, and I must leave my other experiences until later. I do sincerely hope all is well at home, as it leaves me with nothing worse than rheumatics at present. But I am longing to see you all again. I went to "Australia House" this morning to try to get a passage out before next month, but it couldn't be managed. Probably the 6th or 7th of next month will he my sailing date.